Speed of ADSL2+ « But the Obvious! 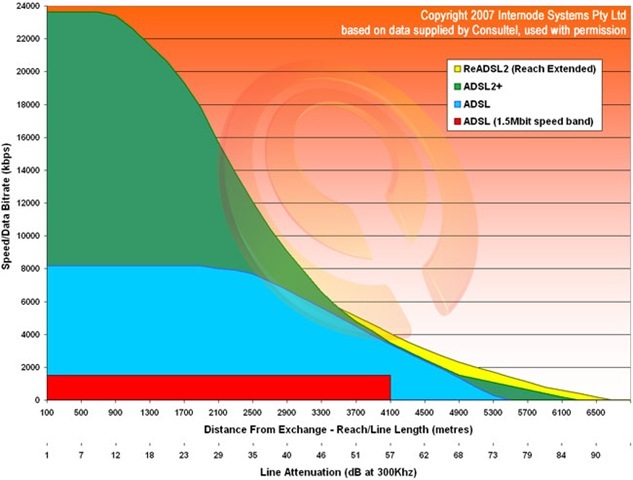 Use the given chart to find what kind of speed your ADSL/ADSL2+ ISP will be able to provide for a given plan on offer. Line Attenuation and distance from the exchange are directly related. The further you are from the exchange the higher will Line Att. be. However, the speed is inversely related to both the above variables. Example, My line attenuation is 27.0 dbM downstream, implying i live around 2 kms from the exchange. Tracing this on the Y graph you can see my ADSL2+ connection will support services upto 17-18 Mbps. i.e. IPTV (3Mbps) and Broadband (2Mbps) will run smooth simultaneously. Example 2, suppose the line attenuation was more than 45.0 then it would be borderline case of being able to run the 2 services of iptv and broadband simultaneously. Accordingly, see for yourself what kind of service quality and line speed you can get before paying for a more expensive ADSL plan from your ISP.